Grant Park is a sprawling Chicago park separating the skyscrapers of the Loop with the scenic beauty of Lake Michigan. During the spring and summer this recreational area has plenty of open green space and is a great place to relax on a park bench to read a book or people watch. Numerous paths dot the landscape for walking, biking, and running. During the winter it has a huge outdoor ice skating rink. Grant Park was originally called Lake Park and constructed in 1847; it maintained that name until 1901 when it was renamed in honor of Ulysses S. Grant. The highlights of the park include Buckingham fountain, Millennium Park, The Art Institute of Chicago and the Museum Campus consisting of the Shedd Aquarium, and the Field Museum of Natural History and Adler Planetarium. 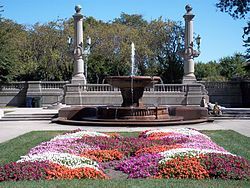 The photo above is of the Beaux Arts Garden on Michigan Avenue near 8th Street located at the south end of the park and is reminiscent of the influential Ecole des Beaux-Arts period in Paris’ architectural history. Near Michigan Avenue, a series of bridges cross the railway tracks which are divided in geometric designs with lawns. Tall American Elms planted in allées create tree-lined promenades, and beautifully arranged flowerbeds and monuments, most notably a statue of Abraham Lincoln and Dove Girl Fountain, round out the parks plan. The Petrillo Music Shell is also located in the park and brings all sorts of diverse outdoor concerts to the city, including Blues, Gospel, Jazz, Country and Classical. Grant Park is also home of Chicago's annual Taste of Chicago, held each summer. Chicago’s Grant Park hosted one of the most historic moments in American history, providing the grounds for President Barack Obama's Election Day victory speech on Nov. 4, 2008. Chicago’s Grant Park also hosted Pope John Paul II for an outdoor mass in the 1970's and was the scene for a number of victory celebrations for Michael Jordan and the Chicago Bulls. It is going to be a beautiful weekend in Chicago, get outside and enjoy. Must add this to the list of places to visit when I go to Chicago. Lovely photo. Thanks for stopping back Kate. Hope you're enjoying nice weather in WI.